Java™ is gaining more and more acceptance in the game development community, and with good commercial-quality Java games on the market, it will become a definitive choice. Practical Java Game Programming identifies the technological path developers need to take to make this happen. 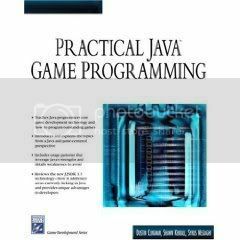 It explores and illustrates cutting-edge Java game programming concepts and techniques through specific explanations from existing Java game projects, with fully executable example code. Intended for both Java programmers new to game development, and for game programmers interested in Java, the book offers usage patterns that leverage Java’s strengths and points out weaknesses to avoid. It teaches Java programmers how to deliver outstanding games and details the specific issues in Java to make game development straightforward and efficient. Java For Artists: The Art, Philosophy, and Science of Object-Oriented Programming is a Java programming language text/tradebook that targets beginner and intermediate Java programmers.